Thank you for applying for e-Tourist Visa (eTV). We appreciate your interest in visiting India. Your Application has been successfully received with the following details. Note: Application will take 72 hours for processing and a response would be sent to the email provided in the visa application. Note : Email generated on 06/MAR/2017 at 10:10:30 AM IST. •	On presentation of ETA to the Immigration Officer on your first arrival, an e-Visa stamp (valid for 60 days from the date of first arrival in India) would be endorsed on your passport. - Please carry a copy of the ETA in this email at the time of your first arrival in India. 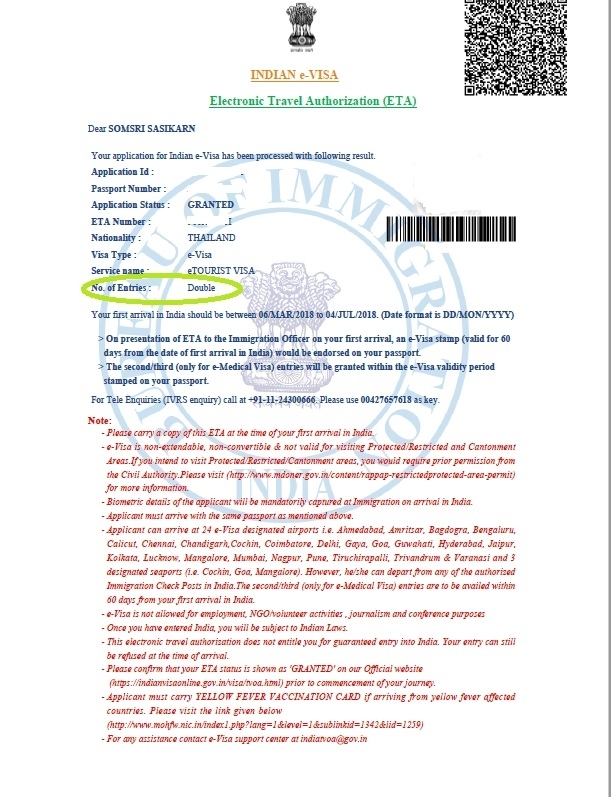 You would be required to show the printed copy of the ETA to the Immigration Officer upon arrival in India. - e-Visa once issued on arrival is non-extendable, non-convertible & not valid for visiting Protected/Restricted and Cantonment Areas. If you intend to visit Protected/Restricted areas, you would require prior permission from the Civil Authority. Please visit (http://www.mdoner.gov.in/content/rappaprestrictedprotected-area-permit)for more information. - Biometric details of the applicant will be mandatorily captured at Immigration on arrival in India. -Applicant can arrive at 24 e-Visa designated airports i.e. Ahmedabad, Amritsar, Bagdogra, Bengaluru, Calicut, Chennai, Chandigarh, Cochin, Coimbatore, Delhi, Gaya, Goa, Guwahati, Hyderabad, Jaipur, Kolkata, Lucknow, Mangalore, Mumbai, Nagpur, Pune, Tiruchirapalli, Trivandrum & Varanasi and 3 designated seaports (i.e. Cochin, Goa, Mangalore). However, he/she can depart from any of the authorized Immigration Check Posts in India. The second/third (only for e-Medical Visa) entries are to be availed within 60 days from your first arrival in India. -e-VISA is not allowed for employment, NGO/volunteer activities, journalism and conference purposes. 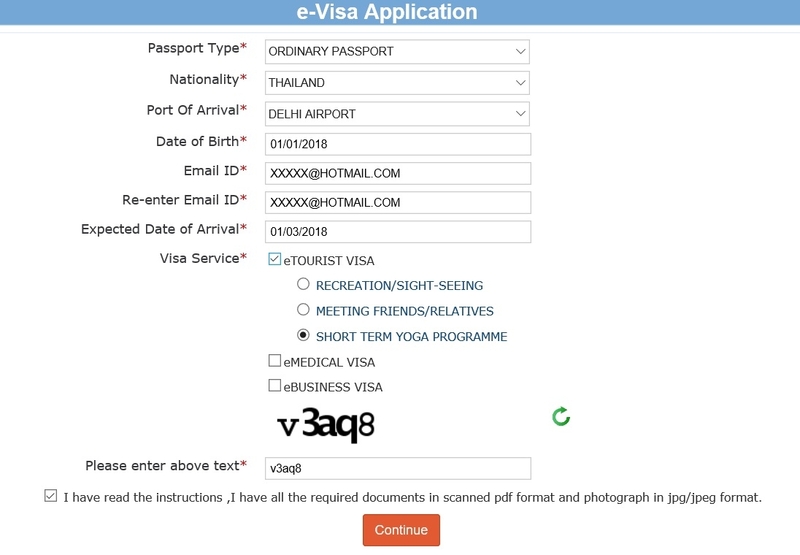 -Please confirm that your ETA status is shown as GRANTED on our official website (https://indianvisaonline.gov.in/visa/tvoa.html)prior to commencement of your journey. - Passport should have at least six months validity from the date of arrival in India.